Disciplinary procedures are a critical tool for management to succeed. 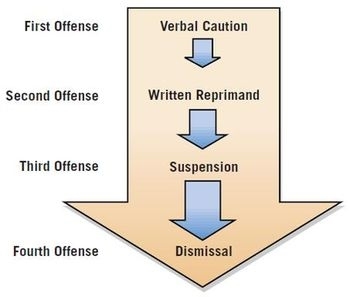 Many people associate disciplinary procedures with negative feedback. If implemented properly, these procedures will positively affect the relationship between a manager and their employees. Employees embrace accountability and it actually improves employee job satisfaction. Correcting employee performance issues is a procedure. Effective interpersonal communication , written communication, and your management skills list must be utilized to assist your employees. Poorly implemented procedures may negatively impact workplace performance. 1. Issue of charge sheet: Once the prima facie case of misconduct is established, the management should proceed to issue a charge sheet to the employee. Charge sheet is merely a notice of the charge and provides the employee an opportunity to explain his conduct. Therefore, charge sheet is generally known as a slow cause notice. In the charge sheet, each charge should be clearly specified. There should be a separate charge for each allegation and charge should not relate to any matter, which has already been decided upon. I would suggest each one of you to talk to find out how is a charge sheet prepared. We will discuss that in the next class. 3. Suspension pending Enquiry. In case the charge is grave that is serious, a suspension order may be served on the employee along with the charge sheet. According to the Industrial Employment (Standing Order) Act, 1946, the suspended worker is to be paid a subsistence allowance equal to one-half of his wages for the first ninety days of suspension and three-fourths of wages for the remaining period of suspension if the delay in the completion of disciplinary proceedings is not due to the worker’s conduct. What is grave will depend on the discretion of the management. It has to be decided in accordance with the Code Of Discipline. 4. Holding of Enquiry. An enquiry officer should be appointed to hold the enquiry and a notice to this effect should be given to the concerned worker. Principle of natural justice must be followed. The worker should not be denied the chance of explaining himself. The enquiry officer should give sufficient notice to the worker so that he may prepare to represent his case and make submission in his defense. The enquiry officer should proceed in a proper manner and examine witnesses. Fair opportunity should be given to the worker to cross-examine the management witnesses. On the conclusion of the enquiry, the enquiry officer should record his findings and the reasons thereof. He should refrain from recommending punishment and leave it to the decision of the appropriate authority. After all he is just an enquiry officer!! 5. Order of Punishment. Disciplinary action can be taken when the misconduct of the employee is proved. While deciding the nature of disciplinary action, the employee’s previous record, precedents, effects of the action on other employees, etc, have to be considered. When the employee feels that the enquiry conducted was not proper and the action taken unjustified, he must be given a chance to make appeal.